With the ever-increasing financial pressures, there has never been a better time to keep your business affairs up to date. Our dedicated team can produce your accounts to a high standard at reasonable rates, taking the pressure off of you. Whether you require accounts for HM Revenue and Customs or to support a financing decision, we are sure that our team can meet your needs. We currently act for clients in a variety of industries giving us access to extensive knowledge of financial trends. The team is used to compiling accounts & financial statements from both computerised and manual records, even a mixture of both. We can also give you advice on practical improvements to your system that will enable you to monitor your business on an ongoing basis. As registered auditors we are licensed to carry out statutory audits on your financial statements, a service that is encouraged by bankers and other finance providers. So whether you are consulting around the world or a handy man for your local area we have the expertise you require! 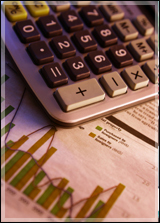 Contact Hyde & Lewis for more information on our accounts preparation & auditing services.